Fried rice balls made with fried rice instead of plain rice...this traditional fried rice balls with a Hawaii twist! Order Fried Rice Cookbook - Come take a journey of discovery through the wonderful world of fried rice. You can make fried rice as good as or better than a restaurant. You make it fresh while you use up your leftovers. Plus, it's easy and fun. 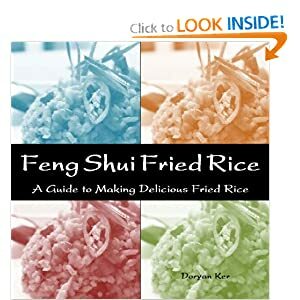 Abounding with rice history, ancient Chinese proverbs, and of course, fried rice recipes and ideas, Feng Shui Fried Rice is sure to become a favorite amongst fried rice enthusiasts. 1. Take a large spoonful of fried rice and form a ball between the palm of your hands. Continue to squeeze the ball between your palms to firmly tighten the ball until it is tightly packed. 2. Dip rice ball into the flour first, then the egg, and finally the breadcrumbs. Repeat this same process again to ensure you have a solid coat of breadcrumbs. 3. Pour enough oil into a frying pan to fry the balls. Turn to medium heat. Once the oil is hot, gently place a ball into the pan and let it fry. Fry each side for about 30 seconds until the entire ball is a golden brown. Then remove from oil. Serve while warm.